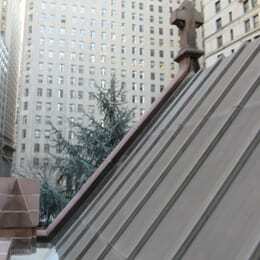 Located in lower Manhattan, Trinity Church has been significant to New York City’s history for over 300 years. 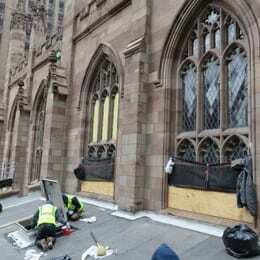 The third and current Trinity Church began construction in 1839 and was finished in 1846. 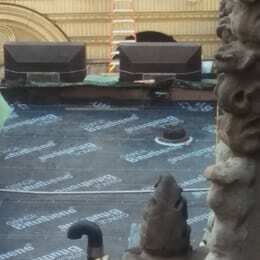 The restoration addressed three roofs at the subject premises: the North Aisle Upper Roof, the South Aisle Upper Roof, and the Connector Roof. 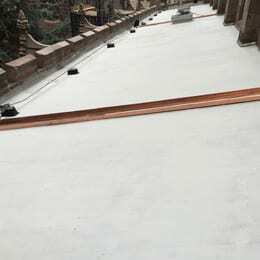 The scope included removal and replacement of the existing built-up roof with a new Siplast fluid-applied roof membrane, flashing, and copper gutters; restoration and soldering of the existing copper and monel roof flashings, re-pitching of the slab, and removal and replacement of roof drains at the connector roof.